Few native reptiles remain wandering around Langley beyond three different varieties of garter snakes. Historical records show our community once included populations of northern alligator lizards, western painted turtles and western pond turtles. Western painted turtles still remain but in very special habitats and in very low numbers. This is also the case in the rest of the Lower Mainland. 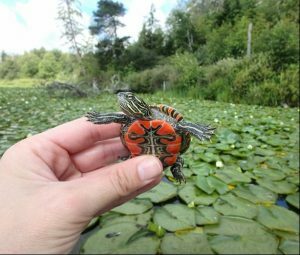 The Western Painted Turtle Recovery Team is working to ensure these captivating herpetofauna will be around for many years to come, and they work right here in Langley! Have you seen a western painted turtle (WPT)? Are you sure??? They look an awful lot like their unwanted relatives (you know the ones – they come over unannounced, overstay their welcome and tend to spread their germs around). Red-eared sliders are a common turtle sold as pets and they look an awful lot like WPT. Sliders are adorable when young; but they soon grow into miserable, smelly, salmonella-carrying bullies. When their novelty wears off many are released into the wild to be free. Yeah right, FREE. Free to gobble up pond vegetation and baby western painted turtles. Free to spread diseases. Free to outcompete our WPT in their own habitat. Check out this link for a handy guide to tell the difference between WPT and red-eared sliders – if you see a WPT please get pictures and contact the WPT Recovery Team at [email protected]. The WPT Recovery Team is on facebook, follow them so your feed will be filled with photos of the cutest baby turtles in the world being released into wetlands all over the Lower Mainland that get their start here in Langley. Please don’t consider a red-eared slider for a pet and it is not legal to sell them.